For the Caribbean medical school, see Windsor University School of Medicine. The University of Windsor (U of W or UWindsor) is a public comprehensive and research university in Windsor, Ontario, Canada. It is Canada's southernmost university. It has approximately 12,000 full-time and part-time undergraduate students and over 3,000 graduate students. Founded in 1963, the University of Windsor has graduated more than 100,000 alumni. "[Teach me] goodness, discipline, knowledge"
AUCC, IAU, COU, CIS, OUA, CUSID, ONWiE, Fields Institute, CBIE, CUP, CARL. The University of Windsor has nine faculties, including the Faculty of Arts, Humanities and Social Sciences, the Faculty of Education, the Faculty of Engineering, Odette School of Business, the Faculty of Graduate Studies, the Faculty of Human Kinetics, the Faculty of Law, the Faculty of Nursing, and the Faculty of Science. Through its faculties and independent schools, the university has demonstrated its primary research focuses of automotive, environmental, social justice, and international trade research. In recent years, it has increasingly began focusing on health, natural science, and entrepreneurship research. 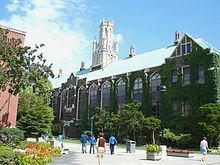 The University dates to the founding of Assumption College Roman Catholic in Windsor, Ontario in 1857. Assumption College, a primarily theological institution, was founded by the Basilian Fathers of the priestly teaching Congregation of St. Basil, in 1857. The college grew steadily, expanding its curriculum and affiliating with several other colleges over the years. On July 1, 1963, the entire campus with all of its facilities and faculty became known as the University of Windsor. As a 'federated member', Assumption University remained as an integrated institution, granting degrees only in its Faculty of Theology. Father Eugene Carlisle LeBel from Assumption became the inaugural president of the University of Windsor, and Frank A. DeMarco, who had been holding both positions of Principal, as well as Dean of Applied Science at Essex College, became the inaugural Vice President. 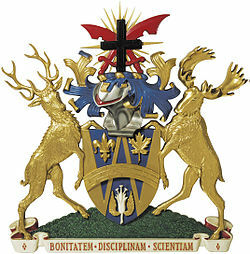 The University's coats of arms were designed by heraldic expert Alan Beddoe. Six months later, Assumption University of Windsor made affiliation agreements with Holy Redeemer College (now Académie Sainte-Cécile), Canterbury College (Windsor, Ontario) and the new Iona College (Windsor, Ontario) (affiliated with the United Church of Canada). Canterbury College became the first Anglican college in the world to affiliate with a Roman Catholic University. In 1964, when E.C. LeBel retired, Dr. John Francis Leddy was appointed President of the University of Windsor, and presided over a period of significant growth. From 1967 to 1977, Windsor grew from approximately 1,500 to 8,000 full-time students. In the 1980s and early 1990s, this growth continued. Among the new buildings erected were the Odette Business Building and the CAW Student Centre. Enrollment reached record heights in Fall 2003 with the elimination of Grade 13 (Ontario Academic Credit) in Ontario. The university has developed a number of partnerships with local businesses and industry, such as the University of Windsor/Chrysler Canada Ltd. Automotive Research and Development Centre and Maple Leaf Sports and Entertainment. Civil Engineering; Electrical and Computer Engineering; Environmental Engineering; Industrial and Manufacturing and Systems Engineering; and Mechanical, Automotive, Aerospace and Materials Engineering. Biological Sciences, Chemistry and Biochemistry, Computer Science, Earth and Environmental Sciences, Economics, Mathematics and Statistics, Physics, General Science. University of Windsor also provides Inter-Faculty Programs offering cross-departmental majors like Forensics, Environmental studies and Arts & Science concentration. There are nine cooperative education programs for 1,100 students. Faculty of Business, Odette Building. The Faculty of Law is one of six in Ontario, and has a major teaching and research focus on Social Justice and Access to Justice issues. It publishes two law journals, the Faculty led Access to Justice and the student run, peer-reviewed Windsor Review of Legal and Social Issues. The faculty offers a variety of courses reflecting its research focus. Law students may study Human Rights Law, Poverty Law, Aboriginal rights law and legal issues affecting women, minorities and children. There is also a strong research emphasis on criminal law, with many notable Faculty of Law professors having extensive experience both in academics and during their careers when on trial. The faculty, in conjunction with Legal Aid Ontario, runs a downtown Windsor community legal clinic called Legal Assistance Windsor that is staffed with supervising lawyers, law students, and social workers; it is aimed at meeting the legal needs of low-income residents and people traditionally denied access to justice. This clinic operates in all areas of law that affect those it is mandated to serve, including landlord and tenant law. The University of Windsor runs a second legal clinic, Community Legal Aid, located at the corner of Sunset and University. This clinic is a Student Legal Aid Services Society (SLASS) clinic, which is staffed primarily by volunteer law students and overseen by supervising lawyers, called review counsel. This clinic operates primarily in the areas of criminal law, landlord and tenant law, and small claims court. The clinic offers free legal services to those who qualify financially, as well as all students of the University of Windsor. The faculty also has a joint, ABA-Approved J.D.degree program with the University of Detroit Mercy. The program is completed in three years with students taking courses at both the University of Windsor and the University of Detroit Mercy. Upon completion students earn both Canadian and American legal accreditation and can pursue licensing in any Province in Canada (aside from civil law in Quebec) and any state in the United States of America. The University of Windsor's philosophy department is known for its work in informal logic, and regularly hosts an international argumentation conference through the Ontario Society for the Study of Argumentation. Students, faculty, and visiting researchers collaborate in the inter-departmental research group the Centre for Research in Reasoning, Argumentation, and Rhetoric. As of 2016, the University of Windsor offers an interdisciplinary PhD in Argumentation Studies, the only graduate program in North America with a focus on this field. 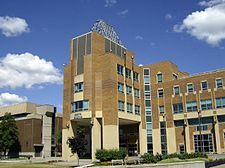 As of 2008, the University of Windsor is also home to a satellite campus of the Schulich School of Medicine & Dentistry of the University of Western Ontario. View of the Detroit skyline from the park bordering campus. Located in Canada's traditional "automotive capital" across the border from Detroit, the campus is situated near the United States and its busy port of entry to and from the United States. It is framed by the Ambassador Bridge to the west and the Detroit River to the north. The campus covers 51 hectares (130 acres) (contiguous) and is surrounded by a residential neighborhood. The campus features a small arboretum, which represents most of the species from the Carolinian forest. Campus is approximately a 10-minute drive from downtown Windsor. The University has moved some academic programs to the downtown core, including Social Work and the Executive and Professional Education program. Music and Fine Arts will follow by 2018. Due to its historical roots in multiple religious institutions, the university's campus has many examples of Christian architecture in addition to its modern flagship buildings like the $10-million dollar Joyce Entrepreneurship Centre. The War Memorial Hall (more generally known as Memorial Hall) is a landmark building used as classrooms, labs, and offices. Memorial Hall honours alumni who had enlisted and died in the First World War, and in the Second World War. A bronze tablet remembers the alumni of Assumption College who died in the Second World War. The CAW Student Centre is the main, comprehensive centre servicing all student needs. It houses a large food court and the main campus bookstore. Also within the CAW Centre: Student Health Services, a dental office, counselling services, a photographer, a pharmacy, the University of Windsor Students' Alliance (UWSA), a Multi-Faith Space, the campus community radio station CJAM-FM, and an information desk. A large public area beside the food court is available for clubs and informational booths to be set up on certain days. For example, during October there is a period where many Canadian law schools set up booths with representatives who answer questions and provide information to undergraduate students. The St. Denis Centre, located at the south end of campus on College Avenue, is the major athletic and recreational facility for students. It has a weight room, exercise facilities, and a swimming pool. The new South Campus Stadium built for the 2005 Pan-American Junior Games is beside the St. Denis Centre - which also has dressing rooms for Lancer teams - and borders Huron Church Road, the major avenue to and from the border crossing. The athletics department has become well known for Track & Field, and Men and Women's Basketball. The majority of the Lancer teams made the playoffs in 2010. The Leddy Library is the main campus library for the University of Windsor. The library’s collection consists of over 3 million items including electronic resources holdings of over 17,000 electronic titles and several hundred thousand data sets. The Scholarship at UWindsor institutional repository provides open access to thousands of electronic theses, dissertations, and faculty publications from the University of Windsor. The Leddy Library is named in honour of John Francis Leddy, former president of the University of Windsor. Dr. Leddy was born in Ottawa, Ontario on April 16, 1911, but grew up in Saskatoon, Saskatchewan. International students make up approximately 10% of the student population; about 1500 students from more than 70 countries. Despite the large number of international students, the majority of students are domestic and come from Windsor and Essex County. Greek Life on campus is smaller at the University, but includes 3 International Fraternities: Delta Chi, Pi Lambda Phi and Sigma Chi; 2 International Sororities: Phi Sigma Sigma and Delta Zeta, and 1 National Sorority: Delta Alpha Theta. All full-time undergraduate students are members of the University of Windsor Students' Alliance and possess a health and dental plan coverage as well as access to The Thirsty Scholar, a newspaper, and a radio station. In addition to the newspaper The Lance, which is partially funded by the UWSA and provides stories written by student volunteers, student at the University of Windsor publish several independent publications. The Student Movement is a grassroots, independent, student run paper providing a critical discourse towards administration and the UWSA. The Issue is a student run electronic publication covering international social justice issues. Leddy Library is the main campus library. The Paul Martin Law Library serves the Faculty of Law. The Canadian Auto Workers Union helped to build the CAW Student Centre which is a central meeting place for students. The University has a unique agreement with the Ambassador Duty-Free Store at Canada's busiest border crossing which provides student jobs, 400 parking spaces, and an annual cash annuity to the school. Students also take advantage of the downtown area located conveniently right down the street. From restaurants to printing shops, to Bubble Tea Cafe's, there are a variety of shops of interest to students. The University houses students in four residence halls on campus. Alumni Hall is home to Beyond First Year and First Year students (coming directly from High School). Alumni Hall has co-ed floors and it is a suite-style residence where suites have two bedrooms that share a kitchenette, and 3-piece bathroom. Beyond First Year students are not assigned in the same suite as First Year students (coming directly from High School). Residence in Alumni Hall is based on grade-point average for First Year undergraduate students (coming directly from High School). Cartier Hall is home to First Year undergraduate students (coming directly from High School). Cartier Hall has co-ed floors, two students share one room and four students share one washroom. Laurier Hall is home to Beyond First Year students. Laurier Hall has single rooms on single gender floors. Macdonald Hall is home to First Year undergraduate students (coming directly from High School). Macdonald has co-ed floors with double rooms and limited single rooms. Windsor Lancers Ice Hockey team plays at the South Windsor Arena. The University joined Project Hero, a scholarship program cofounded by General (Ret'd) Rick Hillier, for the families of fallen Canadian Forces members. The University established Rosa Schreiber Award with the assistance of former University of Windsor Professor Economics, Alan A. Brown. From the University's Senate Committee on Student Awards: The competition award is open to Arts or Social Science students in Year 2 or beyond. Applicants must submit a 1,500-2,000 word essay on some aspect of moral courage. Submission must be made to the Office of Student Awards. This competition will be held in alternate years. It was established in 1995 to honour Rosa Schreiber, an Austrian Freedom Fighter who risked her life to help others during World War II. The University's current President is Dr. Douglas Kneale. He took office on July 1, 2018 as the University's interim president and vice chancellor. It is a member of the National Conference of Canadian Universities and Colleges, the University Articulation Board of Ontario, the International Association of Universities, and the Association of the British Commonwealth. The Lance (Student Newspaper) is a member of CUP. Joe Bowen, sportscaster, "The Voice of the Toronto Maple Leafs"
Murray Costello, retired NHL player, president of Hockey Canada, inducted into Hockey Hall of Fame, the IIHF Hall of Fame, Canada's Sports Hall of Fame, and is an Officer of the Order of Canada, and a recipient of the Order of Hockey in Canada. Dario Hunter, the first Muslim-born person to be ordained a rabbi. John Redmond C.S.B., Basilian priest, teacher, principal, athletic director and coach at Michael Power/St. Joseph High School. ^ "Annual Report 2017 - Endowments". University of Windsor. Retrieved 6 December 2017. ^ "About the University | University of Windsor". Uwindsor.ca. Retrieved 2011-10-15. ^ "Our Universities". Association of Universities and Colleges of Canada. Archived from the original on 2008-10-31. ^ "Enrolment". University of Windsor. Retrieved December 28, 2018. ^ "Alumni Association - University of Windsor". Retrieved 2011-10-15. ^ "Welcome to Research and Innovation at the University of Windsor". University of Windsor. Retrieved December 28, 2018. ^ a b "University of Windsor". The Canadian Encyclopedia. ^ a b "University of Windsor, The". Ontario Heritage Trust. Retrieved December 28, 2018. ^ "University of Windsor". The Canadian Encyclopedia. Retrieved December 28, 2018. ^ a b c d e "Assumption University: Heritage". ^ "University of Windsor, Essex College". Retrieved 28 August 2015. ^ "Alan B. Beddoe Fonds (MG30-D252)" (PDF). National Archives of Canada. 1979. Retrieved March 19, 2019. ^ "History of Canterbury College". ^ "Strategic partnership". uwindsor.ca. University of Windsor. March 4, 2014. Retrieved 3 February 2015. ^ "Faculties and Other Academic Areas". University of Windsor. Archived from the original on 2011-03-13. ^ "Ontario Society for the Study of Argumentation at the University of Windsor". ^ "CRRAR at the University of Windsor". Archived from the original on 2016-03-05. Retrieved 2016-03-08. ^ "Argumentation Studies: Interdisciplinary PhD at UWindsor" (PDF). ^ "Innovation Centre renamed Joyce Entrepreneurship Centre". University of Windsor - EPICentre. Retrieved 2017-12-21. ^ "PHOTOS: University of Windsor Remembers". windsoriteDOTca - windsor's neighbourhood news. Retrieved 28 August 2015. ^ "Common University Data Ontario - 2016: University of Windsor". University of Windsor. 2018. Archived from the original on 2018-03-05. Retrieved 4 March 2018. ^ "Applications, Confirmations, and Registrations by Geographic Origin for Domestic 105s to First Year" (PDF). 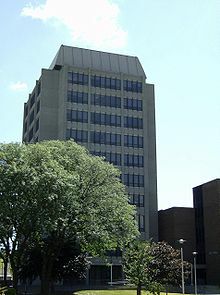 University of Windsor Office of Institutional Analysis. Retrieved March 19, 2019. ^ "Windsor Lancers Mens Hockey Schedule". uwindsor.ca. University of Windsor. Retrieved 2 August 2018. ^ "Project Hero". Archived from the original on 2010-03-14. Retrieved 2011-03-10. ^ Taken from: http://web4.uwindsor.ca/uweb/FinalAbo.nsf/SubCategoryFlyOut/6C7FB75600E7DEAF85257281004EDEF8 on June 17, 2010. ^ "Bio". 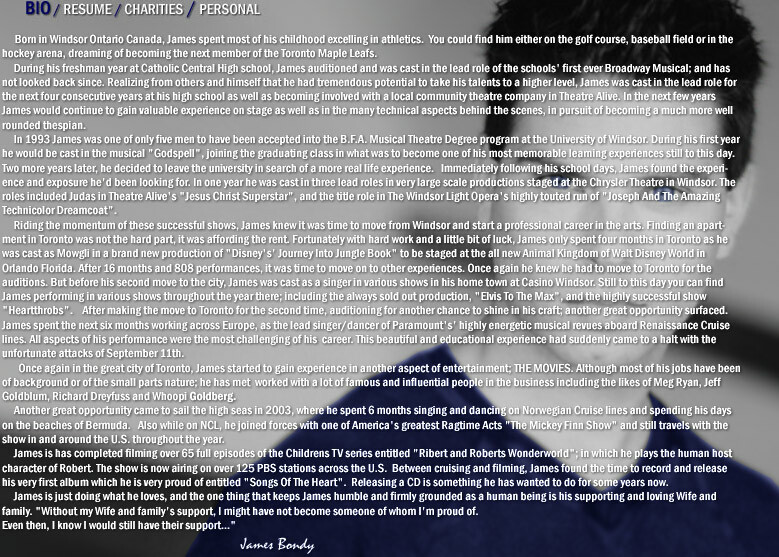 jamesbondy.com. Archived from the original on 2007-10-07. Retrieved 2007-12-02. ^ "Joe Bowen Bio". sportsnet.ca. 1951-04-05. Archived from the original on 2011-10-24. Retrieved 2011-10-15. ^ "Patrick Brown". Legislative Assembly of Ontario. Retrieved December 29, 2018. ^ "Patrick Brown, MP - biography". Archived from the original on 2008-09-15. Retrieved 2008-09-19. ^ "Mayor of Brampton: Patrick Brown". City of Brampton. Retrieved December 29, 2018. ^ Cleary, Martin (2013-10-09). "Costello enters Canada's Sports Hall of Fame". PressReader.com. Ottawa Citizen. Retrieved 2018-03-17. ^ "Murray Costello BA '59". University of Windsor. Alumni Association. Archived from the original on 2018-03-21. Retrieved 2018-03-16. ^ "Real Fight Gear". Archived from the original on 2011-07-15. Retrieved 28 August 2015. ^ "NYC: Ex-Muslim to be ordained as rabbi". YNetNews.com. July 7, 2012. Retrieved August 27, 2012. ^ Napier, Jim (14 May 2012). "Maureen Jennings". The Canadian Encyclopedia. Retrieved 23 January 2019. ^ "Richard Peddie". University of Windsor. Archived from the original on 2013-12-28. Retrieved 2013-12-27. ^ "About the Author Lynsay Sands". Harper Collins. Retrieved 2008-01-11. ^ Williams, Paul. "Amanda Tapping". The Canadian Encyclopedia. Retrieved December 29, 2018. 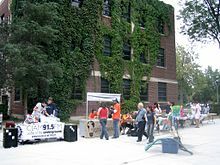 Wikimedia Commons has media related to University of Windsor.